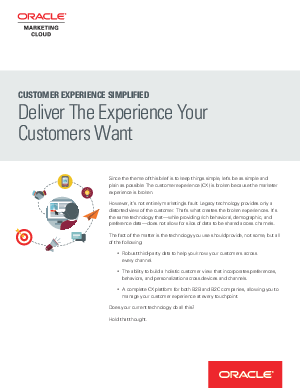 Since the theme of this brief is to keep things simple, let’s be as simple and plain as possible: The customer experience (CX) is broken because the marketer experience is broken. However, it’s not entirely marketing’s fault. Legacy technology provides only a distorted view of the customer. That’s what creates the broken experiences. It’s the same technology that—while providing rich behavioral, demographic, and preference data—does not allow for silos of data to be shared across channels.